"I received the stingray and fish mural today in excellent condition. I believe that, due to the protection of the crate that you packed it in, it could have been dropped from a plane and have no breakage. Thank you for taking such care with it. The stingray and fish mural is everything that I had hoped it to be. I really do like it. I appreciate your help in finding it for me." 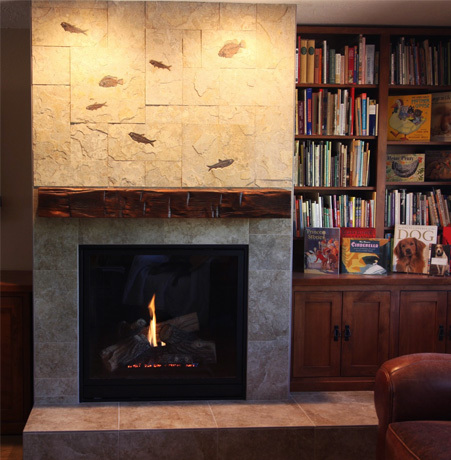 "Green River Stone Company in Logan, Utah changed our home remodel project from the ordinary to the extraordinary. While searching for ideas to refresh our fireplace and master bath, my husband came across photos of fossil fish slabs used as countertops and wall murals and shared them with me. A quick online search revealed more of Green River Stone's gorgeous designs. While our project would be on a much more modest scale, we became excited about adding some fossil fish tiles to our home. A call to Logan revealed that this was not one of the showrooms for Green River Stone products, but rather the business office and product preparation workshop. Nonetheless, we were cordially invited to meet with Jerome Montgomery, Director of Quarry Operations and Western Sales, and look at sample materials. Once there, we realized they normally don't meet with prospective clients at this location, but Jerome and designer Erik Bateman couldn't have been more gracious. We learned about the different kinds of fish fossils available and were able to observe how the raw mateials are meticulously prepared in the workshop. What we thought would be a quick trip to select some tiles has instead turned into a fun collaboration over several weeks. Both Jerome and Erik have taken the tme to make suggestions on the designs, which fish should go where and on what size tiles. Each new idea was discussed with us via phone calls and emailed layouts. Our small project seemed to receive as much time and thoughtful attention as the more intricate designs we saw online. We are thrilled with the two designs created for us and know that our tile setter will appreciate the numbered layout for each tile in each mural, ensuring that the finished pieces will turn out just as planned. It's been great to work with Jerome and Erik who are so enthusiastic and take such care in transforming ideas into reality." "I love the table top! The pictures didn't do it justice, great job! Kudos to everyone involved in the project, including the packaging. I believe it could have circumnavigated the globe and still arrived in perfect condition. Thanks to everyone again!" "Thank you! The tile arrived today and looks AMAZING! We are so happy with this particular one and the quality. Thank you again for all of your help. We will send a picture of the completed project when done." "The shipment arrived a short time ago and all I can say is WOW!!!!! Seeing the tiles on the internet is not nearly what it is like to see them in person and I was excited to see the quality of the fossils as well as the extreme care taken in the packaging of the order. I am passionate about our bathroom project as I feel a connection with your quarry and the Green River formation because of my fossil fish which I shared a photo of with you previously. I am going to get to Wyoming again hopefully within the next year or two and this time your area is definitely on my target list. I will send you photos of the completed project when available. I may be interested in something else from you when we get further along. Thank you all once again as this has been a great experience for me so far!" 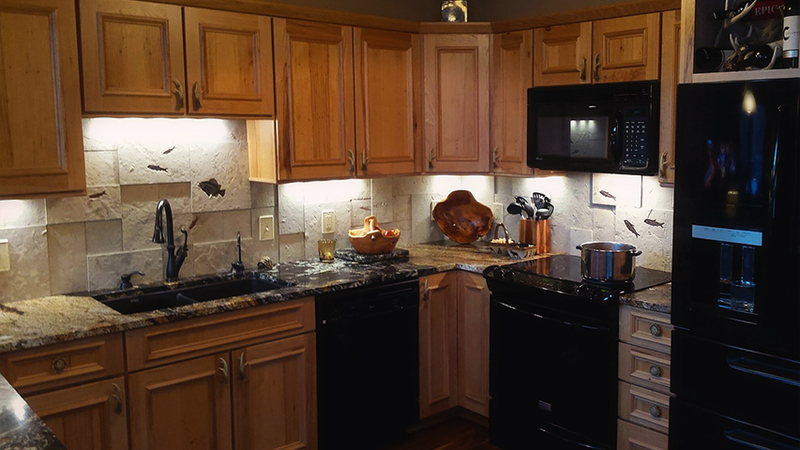 "The backsplash turned out beautiful! My husband and I installed it and decided to pull out some tiles to make it look even more dimensional. We love it and I enjoy looking at the fish fossils every day." "Counter tops have arrived! They fit perfectly. Still have to do plumbing and the top of the cabinent but very close to being done. It's been 14 months since we started. Lots of poor coordination from contractor who quit leaving us high and dry. Your company was the most reliable. Enjoyed working with you. Will send pictures." "The palm gets the most oooohs and aaaahs with the fish in the bath room next. The women prefer the palm and the men the fish. Most folks don't believe the ray is a real fossil at first. Once they realize it is real their appreciation changes. Most people love to run their fingers over the skeletons of both the ray and the fish and they enjoy "discovering" the traces of other fossils within the pieces. The builder and his cabinet guy made sure all three were properly mounted and that the lighting for the palm was dramatic. We are very pleased to have found your company. If any of your clients are looking for a reference we would be pleased to share our very positive experiences with them."